Daily life in the Zanzibar Archipelago centers around the sea, yet the majority of girls who inhabit the islands never acquire even the most fundamental swimming skills. Conservative Islamic culture and the absence of modest swimwear have compelled community leaders to discourage girls from swimming. Until now. For the past few years, the Panje Project has made it possible for local women and girls to get into the water, not only teaching them swimming skills but aquatic safety and drowning prevention techniques. The group has empowered its students to teach others, creating a sustainable cycle. Students are also provided full-length burkini swimsuits, so that they can enter the water without compromising their cultural and religious beliefs. While the wearing of burkini may be seen as subjugation, donning one in order to learn a vital life skill, which has long been and would otherwise be forbidden, is an important first step toward emancipation. Education — whether it be in or out of the water — serves as a springboard providing women and girls the empowerment and tools with which to claim their rights and challenge existing barriers. While the rate of drowning on the African continent is the highest in the world, many community leaders have yet to warm up to the idea of women and girls learning to swim. The swimming lessons challenge a patriarchal system that discourages women from pursuing things other than domestic tasks. 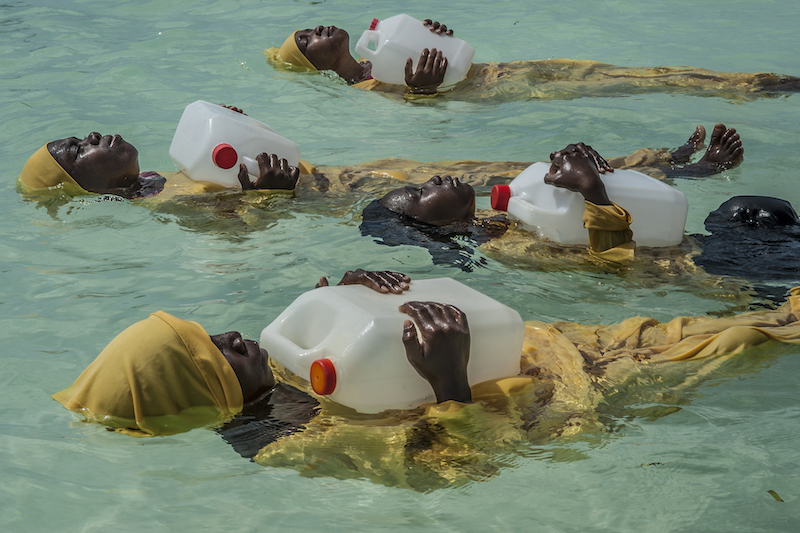 It is this tension of the freedom one feels in and under water juxtaposed with the limitations imposed upon Zanzibari women that is at the heart of this series.